Is a bluish grey in color it is non magnetic, and quite dense. Zinc is also hard and brittle.Zinc has a wide array of uses. It is alloyed with copper to make brass. Zinc is also used in screen doors(the handles, and inside the corners).It is used in locks, artist sculptures, gumball machines and vacuums to name a few. Zinc is a moderately hard metal. It is brittle at room temperature and at temperatures above 150°C, being workable only in the range between 100°C and 150°C. It is an active metal and will displace hydrogen even from dilute acids. Zinc is a very useful material and is present in earth various processes. The metal is very versatile and is used in a number of applications, most notably in the galvanization process to keep metals from rusting. Zinc is used heavily in building structures like metal roofs, plumbing, structural support, and other such components. 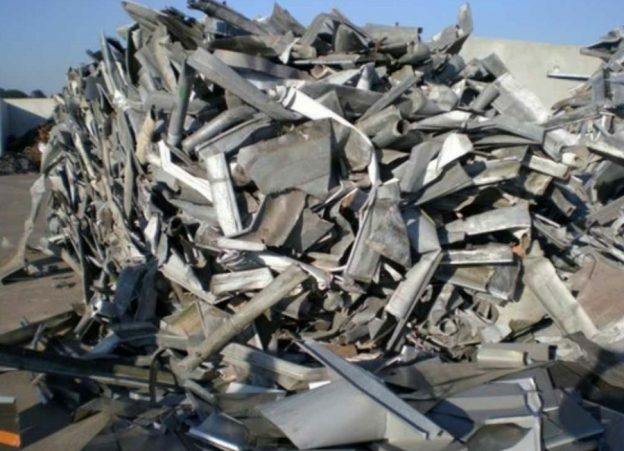 Most people don’t realize that this material can be recycled because few companies provide services for zinc recycling in Toronto. Why is Zinc Recycling Different? Zinc recycling is different because most zinc material is used in conjunction with other metals. For example, the metal needs to be separated from steel in order to be recycled, which adds an extra step to the recycling process. Fortunately, technology has advanced enough to improve the process and now 90% of the collected products that contain zinc can be recycled through the zinc reclamation process. The scrap metal is placed inside the furnace and heated until the zinc becomes volatile. At this stage, zinc separates from steel in a gaseous form and is collected from the furnace. This gas is treated to turn it back to a solid state and it forms zinc dust. The dust is then melted in a kiln, where it turns into zinc oxide. Zinc oxide is one of the primary raw materials in the production of zinc and can be used to create the metal once again. This cycle can be repeated numerous times without any problems with the metal. What are the Benefits of Recycling Zinc? Conserving a non-renewable resource – Zinc is a non-renewable resource and will eventually dry out. Recycled zinc makes up for 40% of worldwide usable zinc and this number will only increase as the recycling technology develops. It’s better to recycle and reuse zinc now than deal with its scarcity later. Reducing waste – If zinc is recycled, it’s not filling the landfills and causing damage to the environment. The more zinc we recycle, the less it burdens the environment and the economy because maintaining landfills and increasing amounts of waste can cost money. Impact of extraction on the environment – Zinc extraction can be a considerable burden on the environment. Dust, metal particles, chemicals, and harmful gasses are released into the environment during the extraction and refining process. While companies try to reduce emissions as much as they can, the process still harms the environment. The recycling process is safer and more affordable too. Zinc recycling in Toronto might be a slightly more complicated process compared to other recycling methods, but it does provide similar benefits and is good for the environment. Zinc is used heavily in building structures like metal roofs, plumbing, structural support, and other such components. The recycling process is different because of the fact that most zinc material is used in conjunction with other metals (for example, the metal needs to be separated from steel in order to be recycled, which adds an extra step to the recycling process). Fortunately, technology has advanced enough to improve the process and now 90% of the collected products that contain zinc can be recycled through the zinc reclamation process.